I anxiously awaited this CD with high expectations, and while I it offered several surprises, it certainly didn't disappoint. 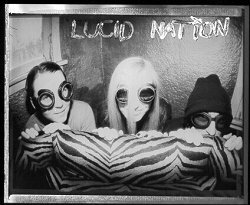 LUCID NATION are one of the best chaotic rock bands on the planet. Their campaign of personal and political awareness is admirable and their music is astounding. "American Stonehenge" is the sophomore release and in it the band veer sharply from the path forged on their debut. This CD is more focused and melodic than its predecessor. Gone is the hectic and frantic nature of the tunes and in its place is a smooth and tight delivery that emphasizes melody while maintaining a sense of exploration. The music seems less random and more pointed yet it keeps the improvisational flavors that so marked the debut. The combination of both male and female vocals gives the band a depth and breadth that helps bridge the diversity in tunes present on "American Stonehenge". A diversity that finds the band swinging between scratchy punk rawk and radio friendly melody often within the framework of the same song. A band with less vision might get lost in transition but LUCID NATION pull it off with consummate ease. A perfect example of this is found in the album's strongest tune, "Food Chain" which somewhat surprisingly uses the raw punk as the hook in the chorus and the melody in the verses. LUCID NATION completed a cross country tour in support of their debut and I'm not sure if they plan to do the same for this CD but per chance they come to your town be sure to catch them. This is the type of music that will bring the house down (or send it up in flames).